Sheldon Langer, DPM and Justin Wernick, DPM began educating their colleagues about the latest advances in lower extremity biomechanics in the late 1960’s. Their goals were simple; help to improve their colleagues achieve better patient outcomes with new science and the products that flowed from it. 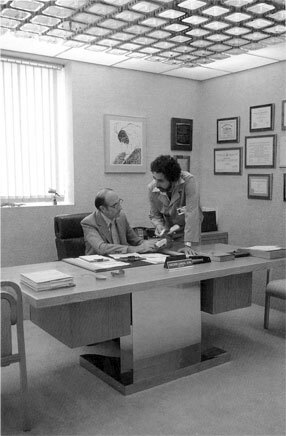 From these humble beginnings emerged Langer Biomechanics in 1971 and an entire industry in the years to come. Today, Langer Biomechanics, Inc. designs, manufactures and distributes a broad range of medical products for the treatment of lower extremity ailments. We sell our products to qualified healthcare practitioners who are involved in the treatment of patients suffering from lower extremity ailments. Our primary market is North America, however there are distributors in Europe, Asia and Australia as well. Our broad range of orthopedic products, including custom foot and ankle orthotic devices, pre-fabricated foot products, footwear, rehabilitation products, and orthopedic materials are designed to correct, protect, heal and provide comfort for the patient. The core principals established in 1971 of Education, Innovation and Quality remain firmly intact today. Picture above Dr.Langer and Dr.Wernick. 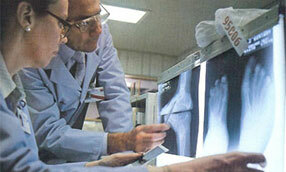 Dr.Langer evaluating a patient's x-ray images.